The SolarQue team is working hard to get you in the Queue. Thanks for staying tuned to our latest developments and sharing with your friends. Please stay tuned for your opportunity to own a piece of the action. We are working hard to launch the SolarQue in April, so hold on to your horses and hor d'oeuvres. The SolarQue is going into larger scale production very soon. We will be taking Pre-Orders through KickStarter.com in just a couple weeks. The SolarQue will need to meet a campaign goal of about $40K to take this next step - we will need your help supporting the totally tubular cooking revolution. We're busily refining the business and our global vision so that we take this big step with our best foot forward. You may already know it's about 5,000 times easier to talk about doing something than it is to actually make it happen - now is the time we are making it happen. We want (and have wanted) you to have a SolarQue for a long, long time. We think you'll find the SolarQue is much more than a novelty, it is a tool capable of serving a great need. We are very excited to get it in the hands of the three billion people who still use wood and charcoal for their daily cooking needs. In case you didn't know, we've increased the size of the SolarQue by 50% so you can feed 3-4 brilliant people at once. 20-30 minutes later and you're ready to feed another 3-4 people. 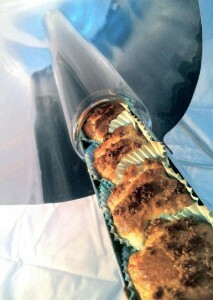 Make your next picnic, campsite or BBQ much easier with this small but mighty solar cooker. To find out more about Our Products Click Here. Whatever fits in the 2.5 inch round tube is going to cook quick in the sun. You will not believe your eyes, your hands or your mouth,when you see this small, but mighty, cooker steaming in the sun. Fill the cooler with a couple bags of frozen food (tator tots, veggies, chicken wings, etc) to keep your drinks cool during your picnic outing. The SolarQue is a one-of-a-kind grill whose performance, safety and quality is unmatched. This is space-age technology that's being brought to you after years of tinkering with appropriate technology to make solar affordable.